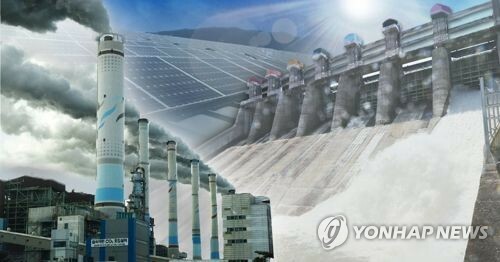 SEOUL, July 23 (Yonhap) -- The venues and infrastructure for the 2018 PyeongChang Winter Games are nearly ready to welcome visitors next year as the organizers are set to put the final touches on their construction projects. A dozen venues -- seven for sports on snow and five for events on ice -- will be used during the first Winter Olympics in South Korea. 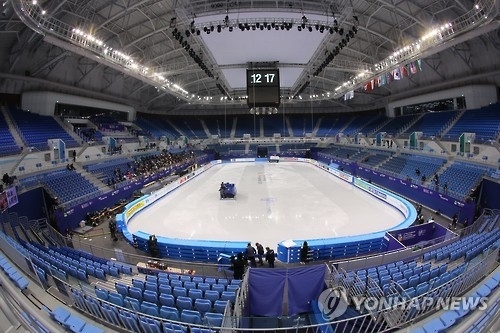 Six are being constructed, while six other existing venues will be refurbished for the quadrennial competition to take place in PyeongChang and its sub-host cities of Gangneung and Jeongseon in Gangwon Province. 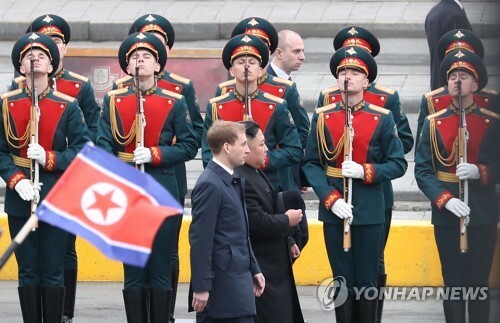 The 2018 Winter Games has two "clusters" -- the PyeongChang Mountain Cluster for skiing and snowboarding competitions and the Gangneung Coastal Cluster for hockey, curling and skating events. The 12 venues are all located within 30 minutes of each other to meet the compact venue concept. As of last Monday, the venues are on average 96.5 percent complete, according to the organizers. 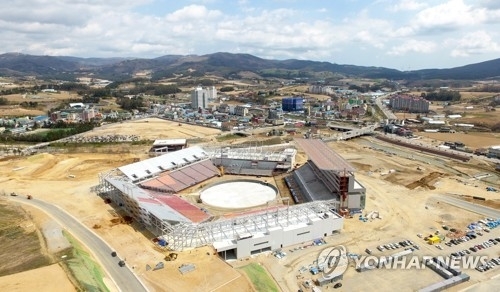 Among the 12 venues, eight of them -- Gangneung Ice Arena, Gangneung Oval, Gangneung Hockey Centre, Kwandong Hockey Centre, Olympic Ski Jumping Centre, Olympic Biathlon Centre, Olympic Cross-Country Skiing Centre, and Gangneung Curling Centre -- are complete and some of them have already hosted test events and major tournaments to check their operational readiness. Other venues are also well on their way to the finish line. The Olympic Sliding Centre, where luge, bobsled and skeleton events will be held, is 94.75 percent complete, while Bokwang Snow Park, where snowboarding and freestyle skiing competitions will be carried out, is 88.3 percent complete. Two venues for alpine skiing events -- Jeongseon Alpine Centre and Yongpyong Alpine Centre -- have completion rates of under 90 percent, but the organizers said construction will be finished in October because both places have already been used as ski resorts. Jeongseon Alpine Centre, home to the alpine skiing events of downhill, Super-G and combined, is 89 percent done, while Yongpyong Alpine Centre, where giant slalom and slalom events will be held, is at about 86 percent, according to the organizers. In addition to sports facilities, the construction of other essential Olympic venues is in the home stretch. PyeongChang Olympic Stadium, where the opening and closing ceremonies will be staged, is only 85.7 percent complete, but the organizers are working to complete the construction by this fall with 35,000 seats. The athletes' villages in PyeongChang and Gangneung are about 86 percent and 97 percent complete, respectively. The International Broadcast Center is expected to be completed by the end of this month. Road and railway projects to enhance accessibility to the Olympic venues are also being carried out as scheduled. For the Games, a total of 1,039 kilometers of roads was newly created in Gangwon Province over the last six years. 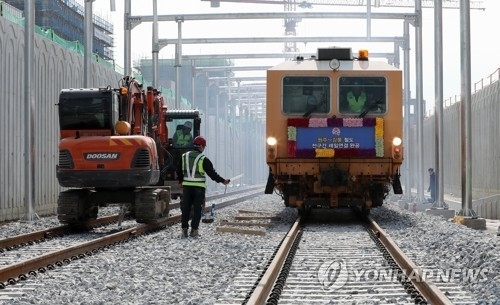 Among them, the construction for a new railway segment connecting Wonju and Gangneung was completed in March, and officials are set to begin testing the bullet train service at the end of this month, according to the Korea Rail Network Authority. 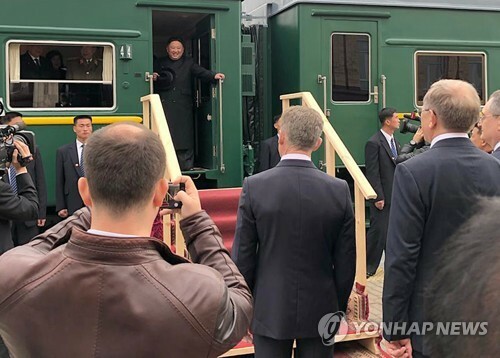 South Korea has been working to build a high-speed KTX train line connecting west and east. 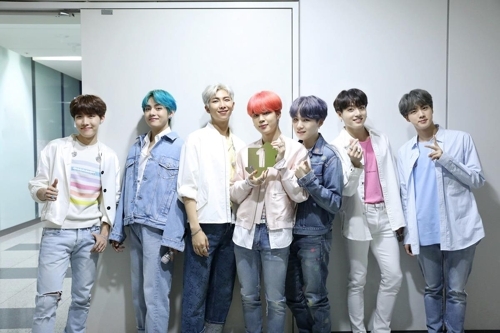 The new segment, which allows for a maximum speed of 250 kilometer per hour, will be added to the existing line that connects Incheon to Wonju. 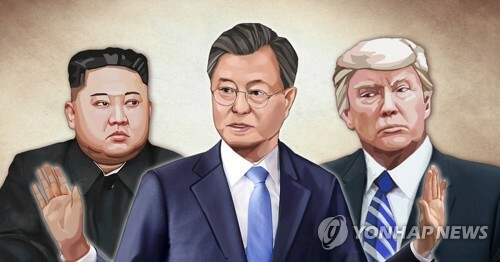 The organizers said once all segments are open, it will take less than two hours to travel from Incheon International Airport to Gangneung. 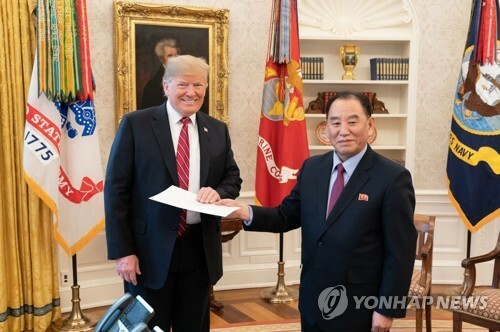 Those who plan to drive to Gangwon Province will also have better access to the venues with a new expressway. 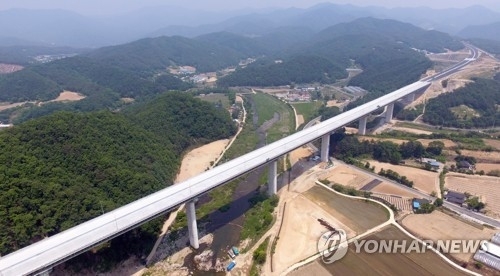 South Korea's transport ministry last month officially opened a segment that runs from east Hongcheon to Yangyang in Dongseo Expressway that links Seoul and Yangyang County in northern Gangwon Province. The new expressway will not only allow visitors to have better access to the host cities, but will also take some traffic volume off of existing expressways. Previously, Yeongdong Expressway 1 was the only major expressway bridging Seoul Metropolitan area and Gangwon Province, but following the opening of Yeongdong Expressway 2 last November -- a route between Gwangju, Gyeonggi Province, and Wonju -- and now with Dongseo Expressway, Gangwon Province-bound traffic is expected to flow better. 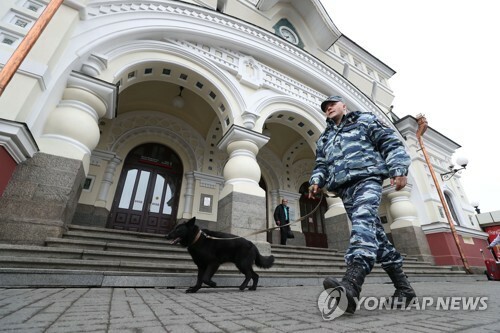 The authorities also said they are also working on renovating road surfaces and other traffic facilities. While improving long-distance accessibility, Gangwon Provincial Government is trying to ensure comfortable and speedy travel near the Olympic venues. The officials are expanding or constructing 16 roads, and nine of them are 90 percent complete, while rest are 75 percent done. The organizers said these roads will be completed by November. 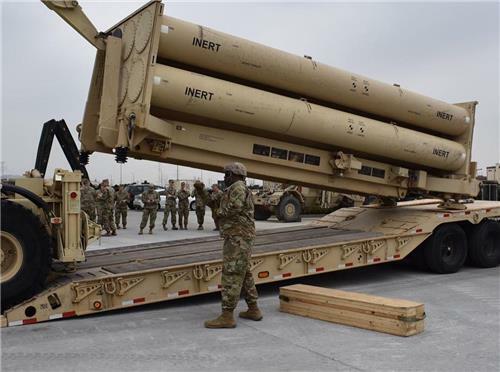 During the Games, however, transportation access to the facilities will be strictly controlled, as only authorized shuttle buses and vehicles will be permitted entry. The spectators will have to leave their cars in a transfer parking lot in a designated area and travel to the venues via shuttle bus.